Now that things are finally getting under control with the house and job (although the job remains crazy and the house needs a new roof), I'm finding time to get back to one of my passions--food! Tonight was pizza from scratch, using my own sourdough-boosted variant on the quick crust recipe from the Berkeley Cheeseboard (the purveyor of, IMO, the best non-traditional pizza ever). 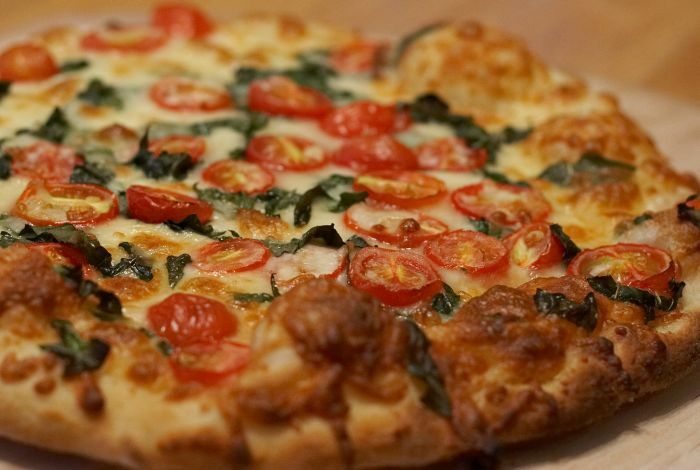 It's not that hard to throw together and pretty quick, actually, especially when you keep the toppings simple--tonight, mozzarella, parmigiano reggiano, roasted grape tomatos, and basil. The convection oven in my new kitchen does such a good job with these that they were almost too pretty to eat. I compromised by pulling out the camera and preserving the visual appeal for posterity before indulging directly in the gustatory appeal!